A trend becomes obvious after a day spent in Istanbul: where there are lots of people there is usually also gözleme. You will come across eateries that specialize in the dish around mosques, at the most frequented metro stops and the bustling street corners that flank markets, bazaars. 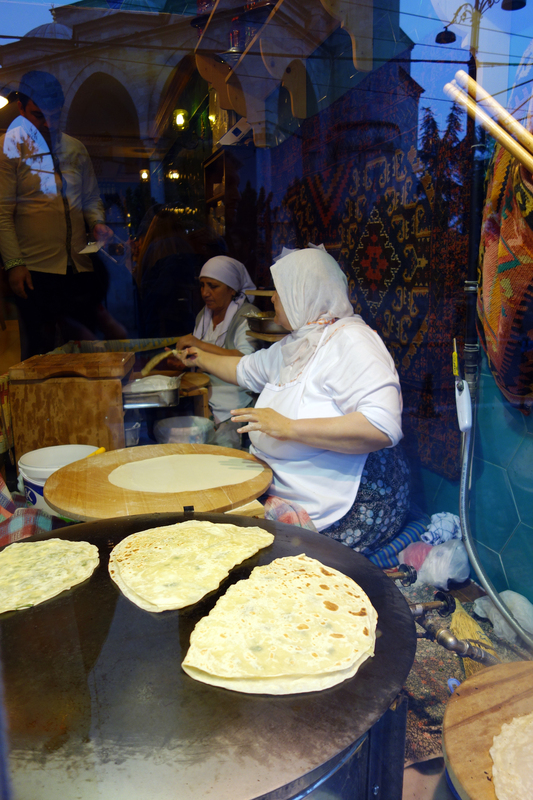 Behind some restaurant windows are usually two or more older ladies wrapped up in bright white headscarves and sitting around a round, wooden board next to an even larger, round, metal griddle. They’re rolling out gözleme, a popular Turkish comfort food best prepared by a grandma, preferably a rural grandma in a village far from Istanbul. The dish originated out in the countryside but the “rural is cool” trend has recently brought it to the city, where I was lucky enough to try it at Firuzağa restaurant in Fatih. 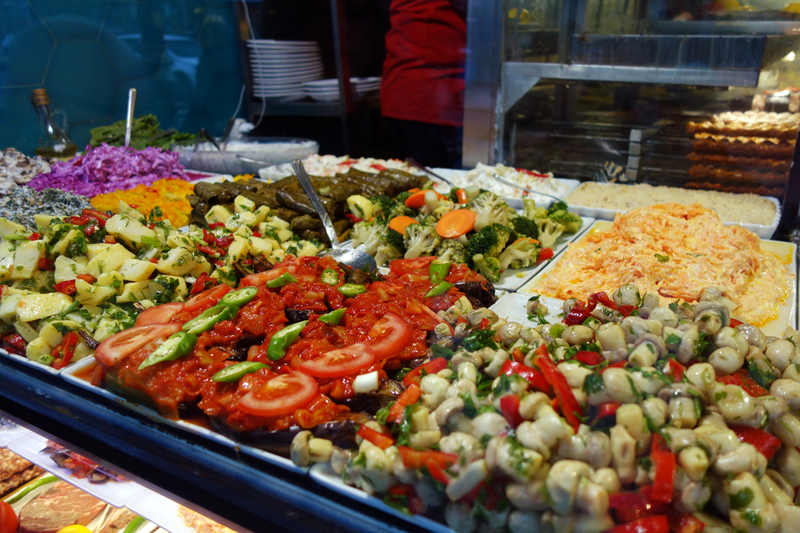 We were window-shopping for authentic and homey Turkish fare to fuel us before jumping head-first into the tourism of the Fatih mosque complex. When we came across this alluring display of ladies behind glass we stopped for a moment to admire them. My companion commented, “Good marketing.” It certainly worked on us. He pulled me by the hand into the restaurant, which also boasted a wide array of mezze, hot and cold. We grabbed a tray and pointed at the things we wanted. It was a colorful mix of salads made with mushrooms, potatoes, tomatoes, broccoli, carrots, cabbage, eggplant and peppers. 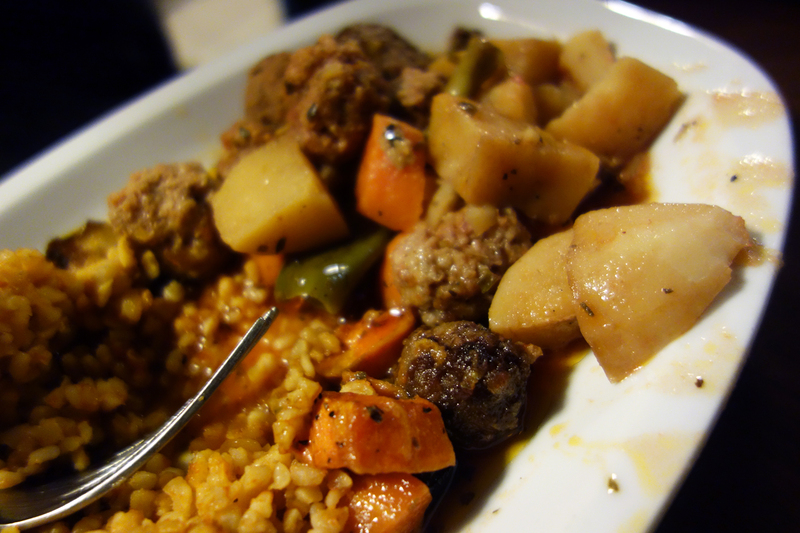 There were also hot stewed meats and meatballs, cooked with veggies and served with grains. I pointed at the ladies, gestured a number “1” and attempted to say “ispanaklı” to specify “spinach and cheese”. The guy nodded a nod that meant, “Okay I will bring it to the table when it’s ready.” We sat with the rest and my companion dug into his meal while I awaited the pièce de résistance. 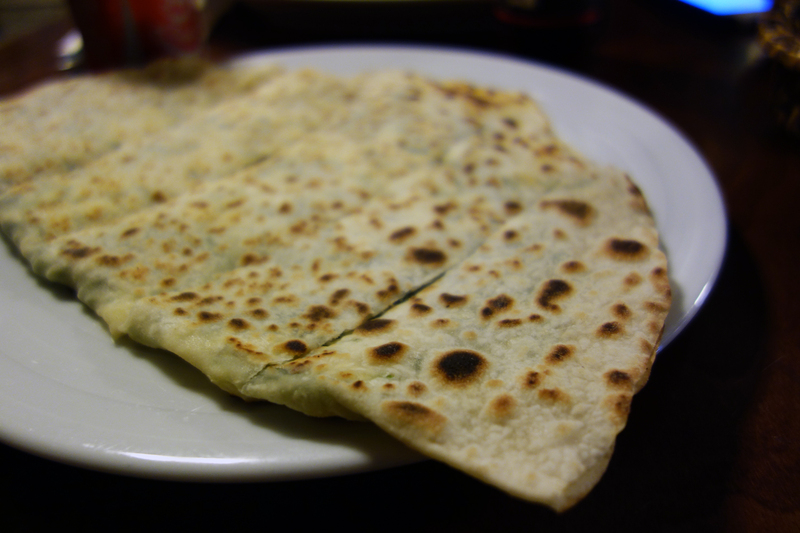 The gözleme: a paper-thin, yeast-free yufka dough stretched into a crepe and cooked on an iron burner called a sac. It’s transported from stretch-board to griddle by means of a wooden instrument resembling a broomstick. It’s oiled generously to achieve its classic crunch against a smooth, consistent texture that shows off the talent of its makers. It’s filled with cheese and spinach, folded over itself and cooked some more until the cheese melts over the green. It’s then sliced to make it easier to tear into. I attacked my toasty gözleme ravenously on a chilly December day. The flatbread crackles pleasantly, crispy and thin, spotted with nutty black dots of char. The filling inside is savory and sweet and in perfect ratio to the bread wrapped around. The creamy spinach is seasoned with nutmeg and melted together with salty kaşar peyniri cheese. The stuff oozes out seductively when bitten into, coating the mouth with its creamy, thick texture. The gözleme: a wonderfully simple and elegant dish that filled me with warmth, energy and enthusiasm to explore. By the time our gözleme arrived at the table, my companion had already wolfed down half his order. He had been hungry. “This is exactly what I wanted,” he sighed after a massive mouthful. At one point he remembered to offer me a taste and I tried his mix of barley, carrots, potatoes, peppers and köfte. The latter is made with ground lamb, a pleasantly bite-sized meatball with nice caramelization going on at the exterior. It’s pretty popular in Turkey and appears in hundreds of forms there, including a particular yummy version in which the meat is wrapped into a bulgur-based batter and fried. As we ate, waiters passed by with massive trays, colorful mixed mezze platters ordered for whole families to share. My mouth watered as I heard kebabs still sizzling on the şiş, as I smelled the deeply herby aromas of the grilled veggies and grains. As a side to my gözleme (not the other way around) I ordered patlicanli yogurtlama, a cold salad made of smoked eggplant with garlic yogurt and mint. It’s a dish beautifully balanced in flavor, with the garlic vibing nicely with the nutty, toasty eggplant and the yogurt and mint waking up the sleepy, comfy flavors of the latter. I also ordered a few dolma, which my Turkish friend corrected to “sarma” after I showed her my photos of things I had eaten. In Turkish dolma means “stuffed” and refers to a dish of stuffed eggplants, peppers or zucchini. Sarma means “wrapped” in that grape leaves, cabbage or chard is wrapped around rice. According to her, plain “sarma” implies that the dish is vegetarian. When it contains minced meat (which usually means lamb) it’s designated “sarma with meat”. So, seasoned rice wrapped in vine leaves is definitely “sarma“. The Greeks mistakenly call the originally Ottoman dish dolmades and the world came to know the dish by this name instead. What’s weirder is that even some Turks call the dish dolma since it has become the more internationally accepted name for the dish. Anyway, it’s delicious. The mushy filling of rice is flavored with spices, sugar and cinnamon. Mixed in are also cooked onions and pine nuts. 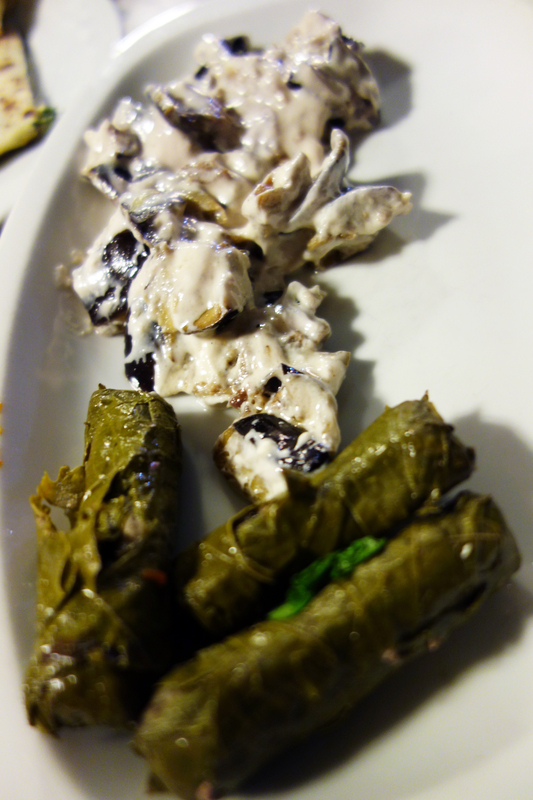 The grape leaves are glossy and tender, wrapped tightly around the tasty, seasoned rice. A colorful mezze and a good opportunity to try a little of a lot. But the gözleme was by far the highlight of the meal. December 22, 2014 in ISTANBUL.